Very Good. 0141185538 ALL BOOKS SHIPPED WITHIN 1 DAY OF PURCHASE! Fair. Bookplate inside back cover. Cracked hinge. Faded spine. First Edition. Foxing/tanning to edges and/or ends. No dust jacket. Fair. This book is from our pre ISBN stock and is therefore over 50 years old. It has a general appearance commensurate with its age including age effects to page edges, binding and boards. This is an ex library book with the usual markings. The dust jacket is missing. This book is from our pre ISBN stock and could therefore be over 50 years old. It will have a general appearance commensurate with its age including age effects to page edges, binding and boards. Dust jacket is absent unles. Steinbeck's "The Moon Is Down"
In 1941, John Steinbeck met with officials of the Foreign Information Service in Washington D.C. to discuss writing a book to assist American propaganda efforts during WW II. He initially prepared a draft of a play centering upon German occupation of a town in the United States. This setting did not meet with approval from the Foreign Information Service, and Steinbeck revised his work. He wrote a short novel set in a small town in an unnamed Scandinavian country which had been subjected to German invasion and occupation. The resulting book "The Moon is Down" was published in 1942. It was transformed into a play and opened on Broadway later that year. A film version of the book appeared in 1943; and, in 1946, Steinbeck was awarded the King Haakon Liberty Cross from Norway for this novel. 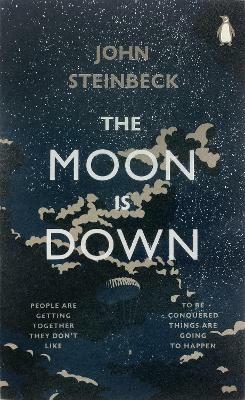 Today, "The Moon is Down" is less well-known that some of Steinbeck's other works, but it bears comparison with his best. The story moves quickly, the characterizations are effective, and the story rises to make eloquently its timeless point about the nature of human liberty. The story opens when the Germans invade by sea a small village to exploit its coal resources in the war effort. For a short novel, the story presents a variety of characters and each of them is individually developed. These include the German commander, Colonel Lanser, a man of education and culture, swift to obey all orders but who has serious inner doubts about Germany's war effort and aims. We also meet several members of Colonel Lanser's Officer Corps, some of whom are full of themselves and of military ambition, while others are lonely and feel the greatest need for the companionship of a woman. The book also includes good characterizations of the townspeople. Among others, the reader meets Corell, the local who collaborates with the Germans and facilitates the invasion, the mayor of the town, Mayor Orden, his friend, Dr Winter, and a woman of indomitable spirit, Molly, whose husband has been shot by the invaders. The book shows the conflict and enmity that develops between the invaders and the invaded as the Germans resort to ever-harsher methods to secure the coal and the townspeople stiffen their resistance in defense of freedom. For all that Steinbeck recognizes the common humanity of all the characters in his story, the book is a ringing affirmation of freedom and of the human spirit. The work is far more than a simple propaganda effort. The book makes emphatic use of products of human creativity and thought in emphasizing the value of human freedom. The climactic scene of the book includes a lengthy discussion of Plato's Apology in which Mayor Orden, Dr. Winter, and Colonel Lanser all participate. Earlier in the book, at another key moment, love poetry by the German author Heinrich Heine plays a crucial role in moving the story forward. I found "The Moon is Down" much more effective than some of Steinbeck's other short novels which are frequently forced upon young readers. While the book is short and easy to read, it is a work of some complexity and of varied characters. Steinbeck in this work met the aims of the Foreign Information Service; but, more importantly, he produced a work of literature that transcended the goals of the war effort. "The Moon is Down" by John Steinbeck, (published in 1942 according to the copy I have) is a wonderfull story of courage and resistance, against all odds. The mayor of this small remote town in "somewhere" Europe seems simple minded but has great courage, as well as the rest of the community he leads when invaded by the German army. Published during the war, it must have been a powerful anti Nazi propaganda piece of literature. If you didn't read it before, read it now!